We conduct canine behavioural assessments for and on behalf of various fostering and adoption agencies. When placing children in to temporary or permanent new homes where a dog already resides, it is often useful to have the dogs temperament professionally assessed as to the stability and suitability of the dog when considering placing a child. Our canine assessment appointments generally last for two hours. Prior to a meeting in the potential carers homes, we ask that our specifically designed psychological profile forms are completed in regard to owner, dog, environment and attitudes. During the assessment meeting; we conduct a variety of tests designed specifically that replicate as closely as possible the child’s likely handling in a variety of ways that potentially would provoke a response in the dog. Owner attitude towards the dog, knowledge of canine care and responsibilities are also looked at as a matter of course as well as the standard of care for and wellbeing of the dog and social conscience. We also frquently conduct assessments when a child has already been placed in a home. 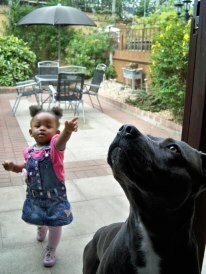 This is most useful to observe child and dog interacting together. Some young people through previous experiences can be unwittingly and occassionaly knowingly antagonistic towards family pets. This can be discerned and worked with. Our findings are then presented in a formal report to the relevant person (social worker/other).